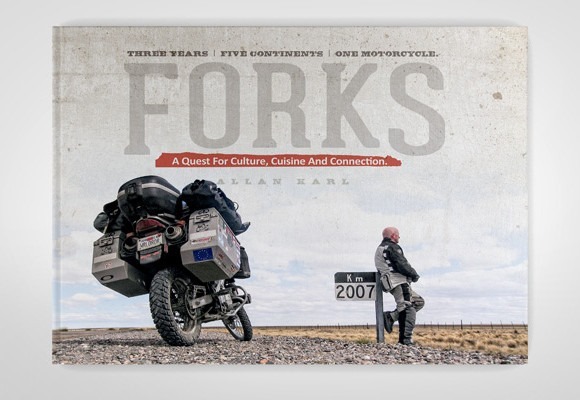 When I first learned of Allan Karl’s Kickstarter project, I thought it to be an intriguing idea and quite different than the usual memoir of “I rode around the world on my motorcycle.” It’s not only unique, it is brilliant. 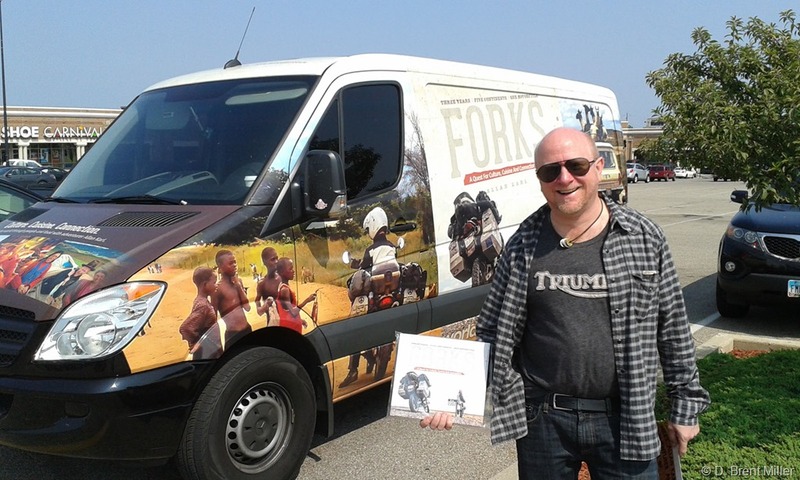 Had Karl taken this trip after the Ted Simon Foundation was in operation, this book would be the poster child for meaningful travel and sharing culture. More about that in a bit. Currently on a book tour, Karl starts out his presentations with “I lost my job. I got a divorce. I might as well ride a motorcycle around the world.” And so he did. Three years. Sixty-two thousand miles. Five continents. Thirty-five countries. One motorcycle. Karl says he started out with the intent he would write a memoir about his travels. Somewhere along the way, he realized that ordinary people in the vast mix of cultures greeted him with friendship and invited him to share a meal. That became the common denominator for the book. We all eat, and when we sit down to share a meal, we are no longer strangers. The book is filled with travels in each of the countries—one country, one chapter, and a recipe. The book tour events build upon those stories—some which never made it into the book, like the Mexican police officer on a motorcycle who stopped Karl for “speeding.” Karl knew it was all about a bribe and tried his best to avoid payment. But it became clear the officer was not going to let Karl go without some kind of payout. Finally insisting that he was nearly out of gas, the officer noticed Karl’s fuel bottles on the back of the bike. He takes the empty bottles, walks over to his motorcycle, pulls the fuel line and fills the empty bottles! Leaving his own motorcycle nearly empty. Shortly, Karl was headed down the road minus the $20. The cop had an answer for everything including giving up his own gas. That’s the energy of attending one of Karl’s book events. The extra stories. You can read about his encounter with guerillas (the AK-47 armed kind) in Columbia, or crossing the border into Syria. Fascinating stories. Crossing into Syria, after several days of delays, the chief inspector would not let Karl go until he shared a tea, and then the chief inspector wished Karl safe travels. Several hours down the road at a gas station, the attendant insists Karl share a meal for it is many miles to Damascus. They sit with tea and share a Fattoush Salad. 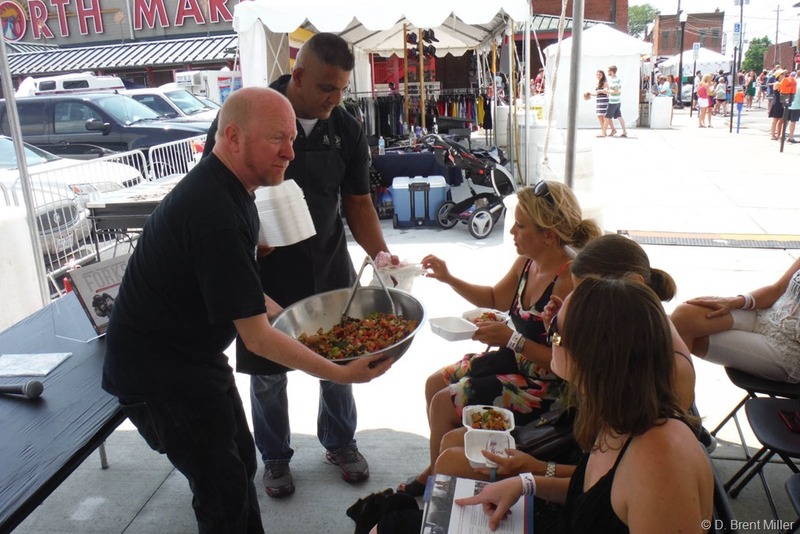 That’s one of the things Karl tries to do in his book events—share a sample of the foods as he did in Columbus, a Fattoush Salad. This is a wonderfully colorful book, 264 pages, incredible color photography, fascinating stories of travel, recipes that will make your mouth water. This is where this book transcends the usual travel memoir. It is a book about meaningful or purposeful travel that brings cultures together and the sharing of a meal. In 2011, a group of individuals created the Ted Simon Foundation to promote world travel for the purpose of sharing culture, unfortunately, after Allan Karl had finished his travels. Currently, the foundation is sponsoring 88 travelers from 15 countries. The foundation mission: “… encourages those who adventure into the world to go the extra mile and transform their experiences into something of value for the world to share.” Allan Karl could be their poster child. Maybe he still can. You can learn more about Allan Karl and his book at WorldRider.com or ForksTheBook.com. Look for him at a book tour event near you. I met Allan at a book signing in Cincinnati Ohio. He did what I have dreamed of my entire life. What an adventure! I’m reading his wonderful book. Congrats to Allan for his extraordinary adventure, and congrats to Brent for eloquently capturing why the book is special. Read it and reap.